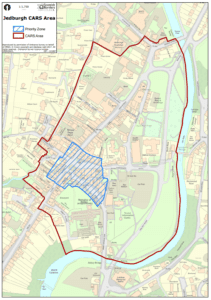 Jedburgh Conservation Area Regeneration Scheme (CARS) is a five year project (2017 – 2022) focused on a range of heritage and conservation based regeneration activities within the historic town centre. It is a partnership project developed along with a community based Jedburgh CARS Steering Group. The project has a budget of just over £1 million, funded by Historic Environment Scotland (£866,500) and the Council (£150,000). The main aim of the Jedburgh CARS is to support the repair of traditional buildings (Pre-1919) within a defined area of the town using appropriate traditional methods of construction. The Scheme provides grants to property owners to undertake repairs and restoration to accepted conservation standards. Grants will be in the region of 70-75% of eligible costs (up to a maximum of £15,000) with owners required to provide match funding of the remaining amount. Opportunities for upskilling of local building trades in conservation techniques as well as the development of community heritage projects will further compliment the Jedburgh CARS project. Grants for repairs and restoration of specific properties identified by the Jedburgh CARS Steering Group and agreed as part of the funding application submitted to Historic Environment Scotland. 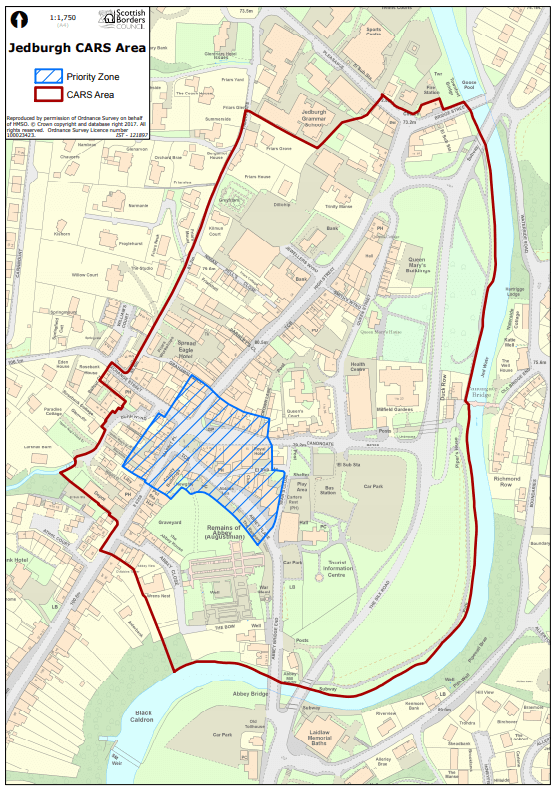 Grants for repairs and restoration of properties within the Jedburgh CARS Boundary. Community based projects to increase the knowledge and awareness of the local historic environment. Opportunities to enhance existing construction skills in appropriate conservation techniques and to encourage conservation related careers. Grant for conservation work to the Jedburgh Abbey Ramparts. Funding will be allocated against a set of eligibility criteria to be published in due course. A Jedburgh CARS project officer will be appointed and potential applicants are encouraged to discuss their proposals with the project officer before submitting their formal application for funding. Grant eligible works must be undertaken by a suitable experienced building professional and building contractor and must be to accepted conservation standards. For further information or to register interest in seeking funding for building repairs contact Aitken Turnbull Architects on 01896 752 760.